We Help People Stay in Their Homes. 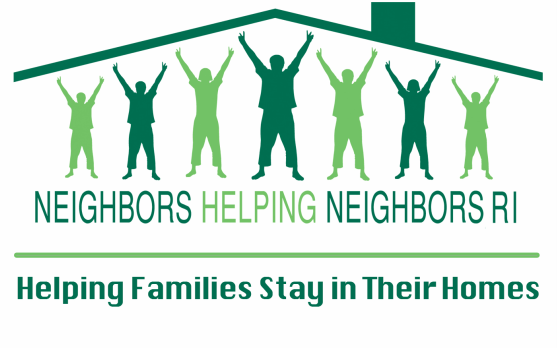 Neighbors Helping Neighbors RI is a 501(c)(3) non-profit organization. We're dedicated to helping families stay in their homes through a variety of ways. Especially by providing necessary home repairs and modifications. It has become increasingly obvious over the past several years that an increasing number of our neighbors in Rhode Island are having difficulty meeting the financial needs of owning their homes. Statistics gathered by State and Federal agencies testify to the accuracy of our informal observations. Rhode Island is in fact one of the least affordable places to live in the United States and Rhode Island has the second largest gap between income and the cost of renting a home in the nation. Based on the number of people who sought shelter, there are more homeless people in Rhode Island in 2014 than there were in 2007. Nearly 14% of Rhode Island's population lives in poverty and more than 15% are not sure where their next meal is coming from and more than 5% of our population goes hungry. ​in a timely manner that improves the quality of life of residents." In June 2015, Jim Hummel interviewed two leaders of Neighbors Helping Neighbors, who talk about the impact the non-profit organization is having in the southern part of Rhode Island. Watch the video that was featured on Rhode Island Spotlight!